Thank you for another great year. Jonah's EB Auction 2013 has ended. Winners will receive an email within the next 48 hours with instructions for how to make payment. Thank you so much for another wonderful auction! I hope to update everyone soon with a tentative total of what we raised for DebRA. Winners will receive an email from me within 48 hours of the end of the auction with payment instructions. Please be sure to follow the instructions in the email closely! ESPECIALLY the part where it asks you to forward me a copy of your payment confirmation from DebRA. That is how I will know that you paid for your items. To all those that didn't win items, thank you so much for participating. If you would like to make a direct donation to DebRA, you can do so by clicking on the DebRA button on the right side of the blog. It will take you directly to the donation form. Thank you so much to all our wonderful donors. You donated such wonderful, fun, and beautiful items. It was a joy to list them all. For those that I've worked with year after year, I've enjoyed getting to "know you". I would also like to take this time to thank a few special people for their dedication to this auction year after year, for without them it wouldn't be anywhere close to what it is. I'd like to thank Lisa Leonard Designs, for sticking with us since the beginning. To Colleen, for keeping the website pretty. Even though you gave me a couple of heart attacks this go round. ;) To Wanda, thank you for your dedication to this auction, but especially the Williams family. Good people like you are hard to find. To Laura, who has been the heart behind so much of our jewelry since the very beginning. You do stunning work an I think everyone who gets a piece of your jewelry feels the love that goes into making it. And Kaitlyn is pretty freaking amazing too. To J, the thing that amazes me the most about you is that you are one of the largest donors to this auction and you do it completely anonymously. It takes an special person to give so much and not expect anything in return. I've never met you, but I could never thank you enough for what you do. I'd also like to send a small thank you to my family, who puts up with my many hours of work when they are used to having a lot more access to me. My sweet girls have been so patient and my husband has been more of a support than could ever have asked for. Thank you for a great 2013 and I look forward to a great 2014. Listings. There is a separate listing post for every item in the auction. Directly below this post, you can find a post with a clickable list of categories. When you click on a link, it will take you to a page that shows you thumbnails of each individual item in that category. "Pinterest View" This year, we've utilized Pinterest to provide a way for you to get a quick view of all items. By clicking here, you will be taken to a page where you can get a thumbnail view of every item in the auction. Clicking the picture of an item will bring you to that item listing. If you aren't familiar with how to navigate Pinterest, you can do so here. Winning an item. The auction is officially over at 9pm on Sunday March 3. The highest bidder when the clock changes to 9pm will be considered the winning bidder for that item. That means if you make your bid at 9pm, you are too late. If you get your bid in at 8:59 and 59 seconds, you are fine (and either gutsy or completely mad). The time stamp on your bid post will be used to determine if your bid was received in time. Payment. If you win an item, payment will be made as a direct donation to DebRA. We've teamed up with DebRA and will have a specific link for all payments to go through. At the end of the auction, I will send all winners an email with that link (and further directions). After the email is sent, payment is due within 48 hours. If your payment is not received in that time frame, the item will be offered to the next highest bidder. At that point, any payment made by the original high bidder will be considered a donation and they will not receive an item in return. I hate to have to include that, but every year we have had people bid and then not follow through on payment. Other donations. Last year, we had a lot of requests asking if there was a way to make a donation to DebRA in conjunction with the auction for those that didn't win items. If you would like to make a donation, you can do so through the web form here or by clicking on the button on the right sidebar of the blog. Shipping. We do not require that anyone pay for their own shipping for items won in the auction. We've collected donations to help pay for shipping. However, if you would like to contribute toward the shipping for your item, I can provide you with a separate paypal link to do so. Any money left over from the shipping fund will go as a direct donation to DebRA. Please note that since it is not being done through DebRA, shipping will not be tax deductible. Site terms. You can find all of our site terms here. Other questions. If you have any other questions, please feel free to post them here or email them to me at jonahsebauction@gmail.com. I will try to get questions answered as soon as possible so that you can get your bid on! I'm so excited for this auction and am incredibly indebted to all of the wonderful individuals and businesses that donated. We have over 160 great items on which you can bid. It's mind boggling (in the best way possible!). I hope that those individuals know just how thankful both myself and Patrice are for their generosity. I thank all of you in advance for taking part in this auction and supporting us with your bids. It wouldn't be much of an auction if we had 160 items and no one to bid on them. Here's to a great and wildly successful auction! The funds we raise here will help families dealing with EB and will help fund research that will someday get rid of this horrid thing called EB. If you are having trouble getting comments to display, try to scroll down below the commenting area and click "comment feed". That has worked for some. If you bid and it shows up, but then refresh and it's gone, don't freak out. It takes a while for the bid to show up in some browsers, especially if we're getting a lot of activity. If you are making the exact some dollar amount bid on two different posts within minutes of each other, Disqus (the commenting system) gets confused and thinks you've already posted that--even if you haven't for that item. Just throw $.01 at the end and it should work fine. We have a ton of items, so it's easy for some items to get lost in the mix. Check out these great items that don't have any bids yet--you might be able to score yourself a deal!! Just click on an item link and it will take you straight to the item post! If you are looking for something in particular, you can view the items by category by clicking on the category name below. Clicking on a category will take you to a Pinterest page where you can view all of the items as thumbnails. If you are not familiar with navigating Pinterest, click here for a quick run through of how to view items and get to auction pages. These lovely earrings have quite the story. 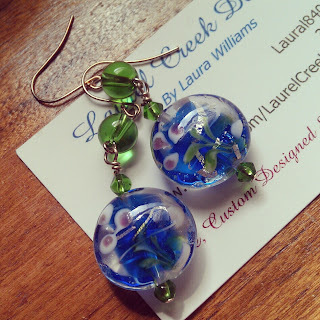 They were sent by Laura of Laurel Creek Designs (a very dedicated supporter of the auction since the very beginning) to be used in the 2012 auction, but very literally fell between some cracks and never got listed. She graciously let me hold on to them for use in this year's auction giveaway. They were won by a woman named Christie Zink. You may recognize that name, because she is an amazing advocate for all things EB. Her I Refuse campaign aims to support the research efforts going on at the University of Minnesota to find a cure for EB. It was little surprise, then, when I received an email from Christie saying that she was thrilled to have won, but wanted to donate the earrings back so they could help raise funds to fight EB. Now they are here for your bid and stand to raise potentially TRIPLE your bid for DebRA. They are valued at $18. Bidding will start at $6. **UPDATE** - There are now TWO copies up for bid! Please read below for more details. 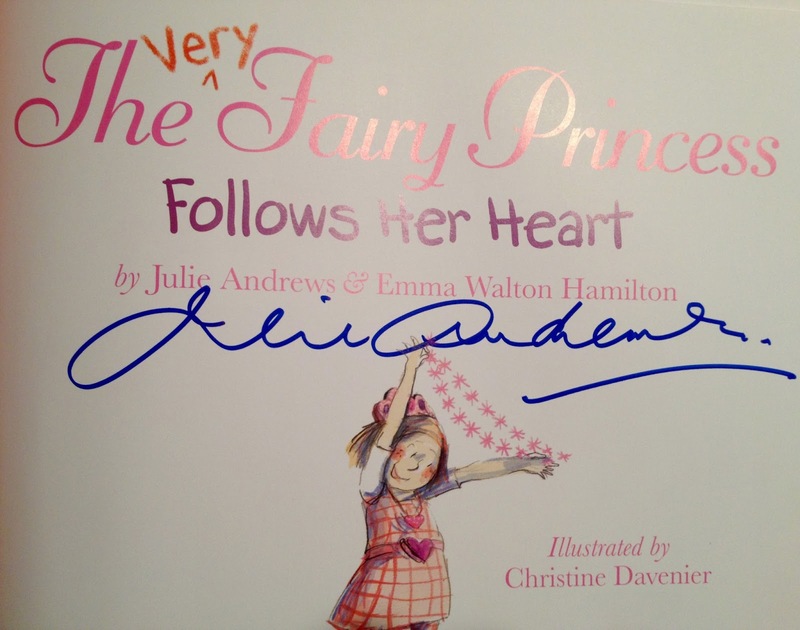 This wonderful book by mother-daughter duo Julie Andrews (yes, THAT Julie Andrews) & Emma Walton Hamilton was donated by Dr. Melissa Keras-Donaghy, friend of Kimberly Williams Tucker in honor of Jonah. It was signed by Dame Julie Andrews in person in Larchmont, NY on February 4, 2013. **Thanks to the big heart of the donor's daughter, we now have TWO autographed copies of the book available! Julie Andrews signed a copy of the book for her, and she has chosen to donate it to the auction in honor of her grandmother, who passed away from a very rare form of leukemia. The books and signatures are identical (see image below) and will go to the two highest bidders. It's Valentine's Day, one of Geraldine's favorite times of year! She gets out her very best glitter to make cards for her family and friends at school, trying extra hard to think of ways to showcase all of their special qualities. But when Gerry gets to school and realizes she accidentally took a folder of Daddy's work papers instead of the cards she worked so hard on - oh no! - she can't help but be disappointed. Thankfully, her teacher helps her find an extra special way to celebrate the inner sparkle of each of her friends. The cover price of the book is $16.99. 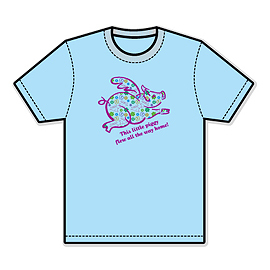 Your little one can be sporting the same awesome shirt worn by our auction's namesake. The shirt is size kid's small (6/8) and is valued at $15. Bidding will start at $5. This beautiful hat was donated by Laura. 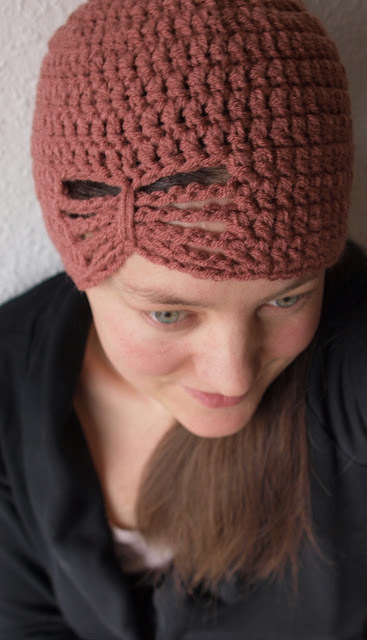 The subtle butterfly crocheted into the hat makes it perfect for our auction. It is valued at $20. Bidding will start at $7. 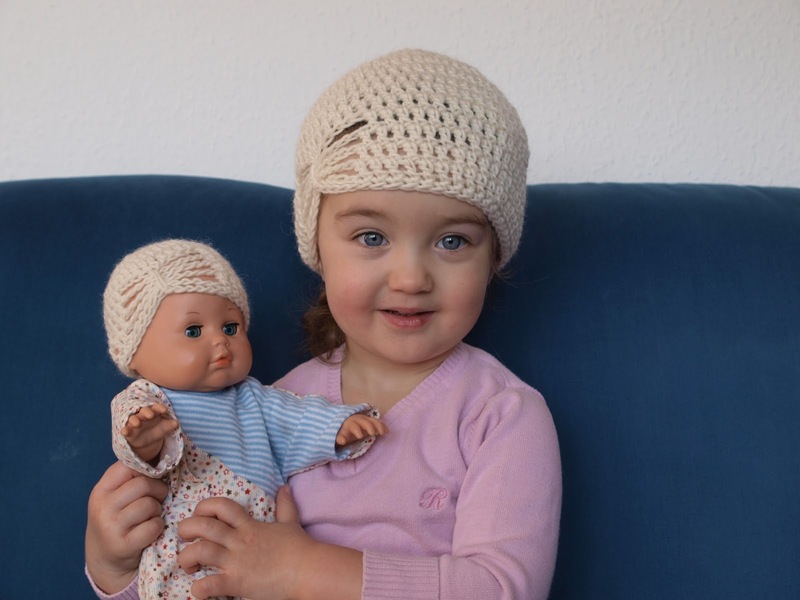 This adorable matching hat set includes a hat for a young child and a matching one for their favorite doll. They were kindly donated by Laura and are have a subtle butterfly crocheted into the hat, making them perfect for this auction. The set is valued at $25. Bidding will start at $8. Inspired by Princess Merida, this apron is fit for any little princess. It is lined so it will keep her clothes clean in the kitchen, but it's also great for dress-up and pretend play. Sized for children 3-7. The apron is valued at $25. The Johnson family has kindly donated this set of 4 Disney Princess cups. Cinderella, Belle, Ariel, and Jasmine each have their own cup which bears their picture on the front and name on back. The set is valued at $12. Bidding will start at $4. This DSLR camera strap cover was donated in honor of Jonah. Each finished strap is approximately 26" long, so it should cover the full length of any standard DSLR camera straps. The strap lightly padded, so it helps prevent the strap from digging in, especially if you are using a heavy lens. It is valued at $12. Erin is kindly donating this awesome Flying Pig Shirt. She wanted to donate the shirt because, "...we have a Team Debra in the Cincinnati Flying Pig Marathon this year, and Jonah is one of the reasons why (I found the blog and have been reading ever since)." Team Debra will beparticipating in this event for the first time on May 5, 2013! 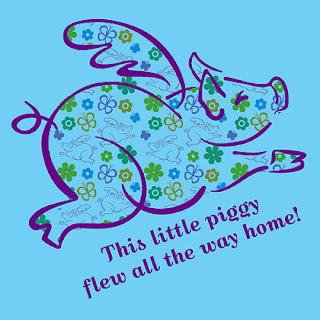 The shirt is an official shirt from the Cincinnati Flying Pig Marathon Store (size toddler M/approximately 4T) and is valued at $14.95. Inspired by Rapunzel, this apron is fit for any little princess. It is lined so it will keep her clothes clean in the kitchen, but it's also great for dress-up and pretend play. Sized for children 3-7. The apron is valued at $25. 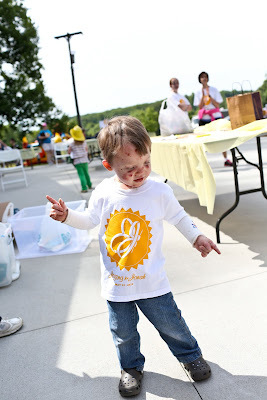 You can be sporting the same awesome shirt worn by our auction's namesake (but in an adult size). The listing is for an adult LARGE t-shirt and is valued at $15. This $25 gift card to Dunkin Donuts was donated in honor of all those fighting EB. This $25 gift card to Build-A-Bear Workshop was donated in honor of all those fighting EB. This $50 Visa Gift Card was donated in honor of all those fighting EB. Bidding will start at $16. Three life coaching sessions with certified Life Coach, Susan Ellis-Saller. and voice to voice for the best potential outcome). plan and then to stick to those plans! doctors and do not diagnose disease, prescribe medication, or promise cure of any sort. Their role is forward looking, goal driven and action-oriented! telephone; plus email support for one month. The session package is valued at $200. Check out http://cubulifecoaching.com for more information. Bidding will start at $50. This $25 Visa Gift Card was donated in honor of all those fighting EB. These turquoise-dyed magnesite leaf earrings dangle from faceted carnelian and smoky quartz rondelles. They have a 2.5" drop and are valued at $10. Laura of Laurel Creek Designs has been a gracious supporter of Jonah's EB Auction since it began in 2009 and has become one of our main supporters and partners each year. This year is no different--you will find 19 pieces from Laurel Creek Designs in the auction, as well as 12 from her incredible daughter. Her devotion to helping others, especially our precious butterflies, is truly inspiring. These turquoise dyed magnesite barrel earrings with pewter bead caps dangle at 2". They are valued at $7. Bidding will start at $3. These coral, white magnesite earrings with pewter bead caps dangle with a 1.75" drop. They are valued at $10. This glasses holder is 26” in length and made with a beautiful assortment of amethyst, with accents of moonstone and pearl. It is valued at $30. Bidding will start at $10. This 5-Strand necklace made of intertwining white glass pearls creates a very elegant statement piece! It is adorned with a butterfly charm at the clasp and measures 25". It is valued at $60. Bidding will start at $20. These beautiful earrings were made withpurple & black lamp-work beads that dangle beneath butterfly charm for a drop of 2.25". They are valued at $10. This purple & black Lamp-work bracelet was made with silver-foil lined glass beads and closes with a lobster clasp with a dangle butterfly charm. It measures 9" and is valued at $20. Bidding will start at $9. This Black South sea shell pearls bracelet with pewter bead caps, glass spacers, toggle clasp, and butterfly charm measures 8.5" and is valued at $18. This 8.5” black, gray, and light plum lamp-work glass bracelet was hand made with fun ‘bumpy’ beads and a butterfly toggle clasp. It is valued at $18. This pink, raspberry, & black lamp-work glass bracelet has a lobster clasp and butterfly charm. The length is adjustable from 8.25-9.5”. It is valued at $18. Become a fan of the auction!